You know that you should eat healthy even when you're snacking, but you're too busy to do much more than grab something from a vending machine or convenience store. Stock some of these delicious and good-for-you foods in the gourmet kitchen of your Springs luxury apartment home, so they're ready to grab when you're ready to go. Eggs got a bad rap in the past for being high in cholesterol, but scientists have found that their low saturated fat content more than compensates. Today, eggs are considered a nutritional powerhouse, full of vitamins and antioxidants, and they're easy to take and eat nearly anywhere. "Bad" snacks are often high in carbohydrates, so lean protein content makes beef jerky a good choice. Want to be creative? Make your own jerky from beef, turkey, deer, elk or salmon. Edamame, which is simply immature soybeans, is another protein-rich food that's also high in fiber. It comes both fresh and frozen, while dry-roasted edamame has a satisfying crunch. This classic snack got its name because it was a favorite of hikers, but it has become a popular choice for any occasion. Part of the appeal of trail mix is that you can make your own, so the potential combinations are endless. Kale has become a trendy ingredient, but it deserves its place in a healthy lifestyle. The Centers for Disease Control and Prevention place kale at #15 on their list of superfoods. 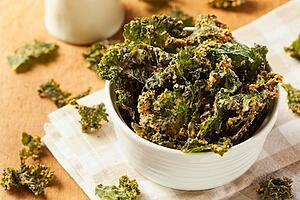 If you have a weakness for chips and crackers, try some savory and smoky kale chips and you may become a convert. High-protein snacks satisfy hunger without the sugar spikes and crashes of carbohydrates. Make a "breadless sandwich" by pairing some thinly-sliced lunch meat with a slice of cheese and rolling it up. Wrap in in a lettuce leaf or eat as is. You're probably familiar with this yummy dip made from garbanzo beans, garlic and lemon, but you're also wondering how portable it is. Just put one-third of a cup of hummus in the bottom of a travel coffee mug or Mason jar, then "plant" stalks of celery, carrots and other veggie sticks. If you want some variety, cut some pita bread in wedges and put it in a sandwich bag. A Mason jar also makes a handy container for a luscious yogurt parfait. Start with some non-fat Greek yogurt (vanilla works best!) and layer it with your choice of ingredients such as berries, nuts, honey and granola. Tuna and salmon are packed with heart-healthy omega-3 fatty acids, but canned fish is messy. StarKist® has a full line of tuna and salmon single-serve pouches that are shelf-stable and portable. They come in classic water and oil along with flavors such as Thai Chili, Lemon Dill and Mango Chipotle. Do you have a favorite healthy snack that's easy to make and fun to eat? Tell us in the comments!